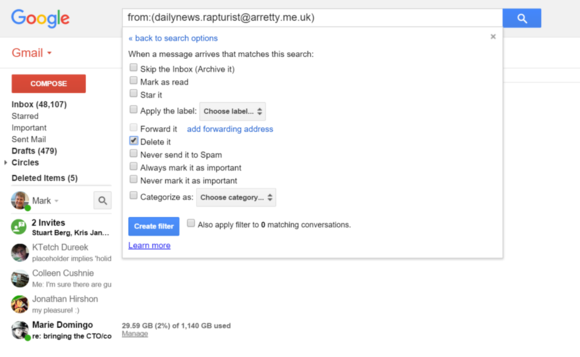 Setting up an automated filter to delete unwanted emails also does the trick. We'll show you how to do it. Google said Tuesday that users will now be able to “block” specific email addresses—except that they’re not really blocked, and Google already has more powerful tools to eradicate offensive email that are already in Gmail. As of Tuesday, “blocking” an email will actually send an email from that specific email address to the spam folder—where it will technically live on, even if no one really checks their spam folder. Technically, neither Gmail nor Yahoo Mail offer a “block” option, in which a hateful email is simply never received. Microsoft’s Outlook app for Office allows you to “Junk” an email—either from the specific sender or the sender’s domain—something that Google’s Gmail doesn’t allow. Why this matters: If you whack a spider and miss, and then it crawls under your bed—well, that’s going to creep some people out. Ditto for your psycho ex-: some people don’t want to even see an email (and its header) in their inbox. Blocking that email is one solution; totally eradicating it via a “delete” filter may appeal to others. How do you do the latter? Read on. In your inbox, select one or more messages using the little checkboxes to the left of the message. At the top of the list of messages, you’ll see a number of icons with drop-down menus. Click More . > Filter messages like these. That will open up a screen, pre-populated with the email addresses of the senders of the emails you highlighted. Note that you can also add specific words in the fields—the subject line, and more, if you want to fine-tune this further. Where this gets confusing—and this is possibly the reason for the new Block command—is that clicking Create filter with this search does not actually create the filter. Instead, it takes you to a second page, where you have a number of options to apply to the message. The one you’ll want, in this case, is Delete. Granted, deleting an email means that it’s gone forever. (Edit: As a reader points out below, "deleting" an email send it to the trash, rather than blocking it at the server level.) But if you’re desperate to never hear from a particular email address ever again, you’ve found a possible solution. 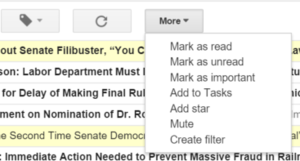 Use this filter to automatically delete an email in Gmail. There’s another twist: The Block feature will be added to the Gmail Android app next week. You can only dial up the Gmail filters we’ve shown you above, however, on the desktop version of Gmail. Block may become a weapon of last resort if you don’t own a PC. Fortunately, there’s a kinder, gentler option to those automated mailing lists that you wanted to see, once, and never want to see again. The Gmail Unsubscribe function is also coming to the Android app. That allows you to both issue an automated unsubscribe command, as well as hide that spammy list from your inbox, Google said. Correction: "Deleting" an email in Gmail means sending it to the Trash, not blocking it at the server level.